A former prison for the criminally insane, Varos is now ruled by the descendants of the guards. The Doctor and Peri, together with rebel fugitives Jondar and Areta, find themselves trying to escape the Dome's traps and challenges, all on live television. Meanwhile, the fair but strict Governor tries to negotiate a new deal for Zeiton-7 with Sil, an unpleasant slug-like alien from the Galatron Mining Corporation who has kept Zeiton-7's true worth a secret. 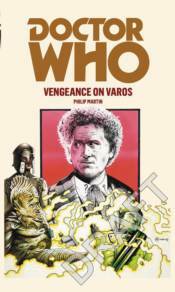 Can the Doctor and Peri escape the Punishment Dome, and help the Governor ensure the people of Varos get a fair deal for their Zeiton-7? This novel is based on a Doctor Who story which was originally broadcast from 19-26 January 1985. This title features the sixth Doctor as played by Colin Baker with his companion Peri.